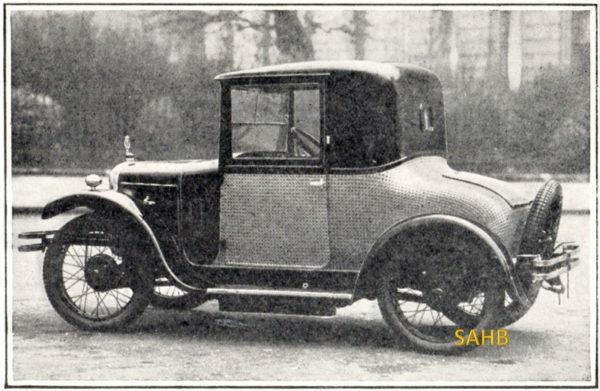 They say you can’t make a silk purse out of a sow’s ear but coachbuilder Maythorn of Biggleswade did when they built several 2-seater coupés with single dickey seat on the Austin 7 chassis. The ‘baby’ Austin was hardly a sow’s ear but, equally, it was hardly the sort of chassis that could justify the cost of a lavish coachbuilt body. Unless, that is, wealthy customers could be found who would be amused to do just that. This delightful 1927 example, chassis 36828, was built for Mr Pulitzer, the newspaper magnate of New York, for use at his home in Palm Beach, Florida. It was finished in black with superb canework around the body tub, an opening screen, and hinged running board box. Internally there was sumptuous woodwork and a raised dashboard, grey leather and grey cloth interior with chrome fittings throughout. The Sketch for 14 December 1927 praised the car as ‘delightful’. This car survives and was last seen completely intact in the 1940s but in the 1970s it was restored without canework and fitted with a light cloth interior. Another low-mileage example survives with its canework.